Vinegar is a product which consists mainly of acetic acid and water. The acetic acid is produced by the fermentation process; acetic acid bacteria oxidize ethanol to acetic acid. 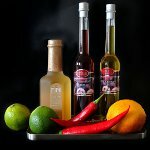 Vinegar is divided into different types depending on the foods that are being fermented. Here are some vinegar types: wine vinegar, apple vinegar, fruit vinegar, balsamic vinegar, and even beer vinegar. Vinegar was initially used mainly for preserving and pickling foods. Nowadays it is also widely used in cooking as a common ingredient of salad dressings, marinades, sauces. It can also be sprinkled on various dishes as a condiment and substitute for lemon juice in recipes. Aside from its culinary uses, vinegar can also be used as a cleaning agent as it contains mild acid. It is also used in medicine to help ease the pain of jellyfish stings; when applied to the affected areas, vinegar deactivates the cnidocytes, explosive cells released by jellyfish. To celebrate the National Vinegar Day, cook any dish that includes vinegar, be it salad with vinegar dressing, strawberries with balsamic vinegar, or pickled vegetables.